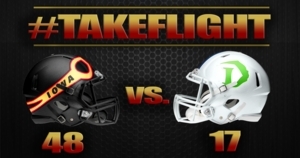 Des Moines, IA – The Iowa Barnstormers (12-3) defeated the Nebraska Danger (4-11) by the score of 48-17. Barnstormers being the number one seed in the playoffs, hosted the Danger Friday night in Wells Fargo Arena. They will host the United Bowl July 7 in Des Moines. The Danger took an early lead in the first quarter scoring on a one yard pass from Gregory Hankerson Jr. to Donta Armstrong. The Barnstormers stalled their first drive, but with 1:16 left in the first quarter Drew Powell connected with Ryan Balentine on an eight yard pass to tie the game. The Barnstormers defense was clicking to start the second quarter forcing the Danger to a 24 yard field goal made by Brad Hatfield. The eight play drive took 5:31 seconds off the clock, which put the Danger back in the lead with the score being 10-7. Drew Powell and the offense took the ball the down the field the next drive where he would punch in a one yard run to put the score at 14-10. Closing out the half with :12 seconds left, Powell ran 11 yards for his third touchdown of the night. That would conclude the scoring for the half, with the score being 20-10 Barnstormers. Coming out of halftime the Barnstormers looked to extend their lead and they did just that with another Powell one yard touchdown run. Josh Gable kicked the extra point through to put the Barnstormers up 27-10 with 6:31 left in the third quarter. Hankerson Jr. looked to lead a comeback drive for the Danger by throwing a four yard touchdown pass to Angelo Pease late in the third quarter. Rocky Hayes caps the night off with his second of three interceptions, taking it back to the endzone to seal the win for the Barnstormers, 48-17. The Barnstormers await the winner of Saturday night’s game between Sioux Falls Storm and Arizona Rattlers. The Barnstormers will host the United Bowl on Saturday, July 7 in Des Moines. The championship game will take place at Wells Fargo Arena and kick off at 7:05pm. Tickets are available, contact the Barnstormers front office at 515-633-2255.